Breeze RV Resort is located in the vacation destination of Park Rapids, Minnesota; headwaters of the Mississippi River at Itasca State Park. 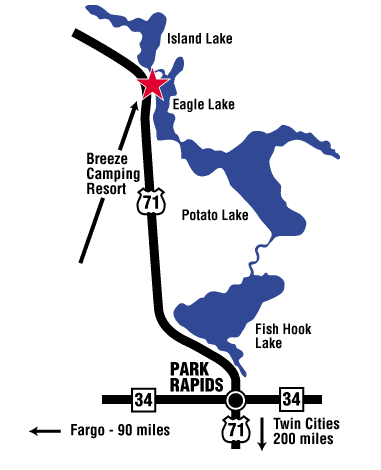 Campers of this Park Rapids RV resort can enjoy the area’s numerous lakes, miles of scenic trails, unique shopping and delicious dining. The Travel Channel recently listed Park Rapids among the “50 Most Charming Small Towns in America.” For additional area information visit www.parkrapids.com. Is fishing or water activities your pastime? Breeze Resort is situated on the sandy shores of Eagle Lake, part of the Potato Lake chain of lakes. If golfing is your passion, check out the many courses in the area, including Eagle View Golf Course right next door!